This is part of my Indie Book Review series. For more information about this series and what my background is, go here to the first indie book review. Indie Reviews are tagged as such on my blog. Without further ado, here is my review of Beneath the Silver Rose! Beneath the Silver Rose is a strong start to what promises to be an exciting series full of mystery and action. Shadyia is a courtesan, but she’s not just any courtesan. She’s feisty, loyal and tough. The book opens with a terrible choice for Shadyia, either she allows a noble to humiliate and beat her as a petty revenge toward a rival noble who enjoys Shadyia’s company, or she strikes him down and endangers the lives of all the sisters she lives and works with. What she chooses to do in this moment will have lasting repercussions throughout the entire first novel in the series, repercussions that effect not only those who work in the Silver Rose, Shadyia’s place of employment, but also other players in a far more deadly game for power. Over the course of the story, we learn that there’s a lot more at stake than just the fates of Shadyia’s sisters. Fairly quickly, we are introduced to dark forces that are centuries old. This ancient power is busy manipulating the world around Shadyia without her knowledge. We catch glimpses of what this being is doing as Shadyia struggles to survive with her decisions and the changing atmosphere at the Silver Rose. Needless to say, Shadyia faces more problems than the ire of the nobility. T.S. Adrian has deftly created a rich world in which to play out this tale of intrigue. Characters are full of life, settings are detailed and varied and the history of the world Shadyia inhabits is full of interesting lore. Adrian’s narrative style is almost conversational, as if each time the narrator takes control, you’re actually peeking through a characters eyes, without resorting to using first person, giving the story a well-rounded feel with many perspectives to explore. There’s a fun twist around the half-way point related to these inner thoughts that I won’t spoil for you. I had one of those “A-ha” moments as I read the reveal. It’s clever and made me wonder if I should start all over with a more careful eye to detail to fully examine the central mystery of Beneath the Silver Rose. The conceit Adrian uses is genuinely one of the more interesting things I’ve read in a book in quite some time. The pacing of the book is brisk – you won’t find the story lagging as Shadyia bolts from one challenge to the next. 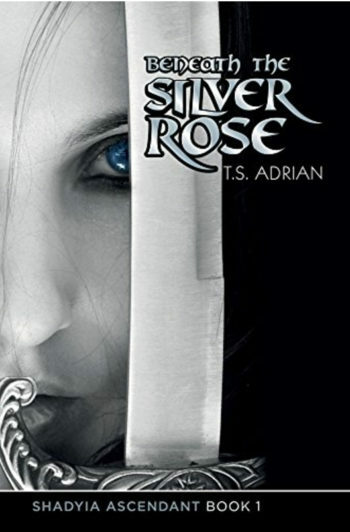 There’s lots of excitement to be found among the pages of Beneath the Silver Rose, whether it’s detailed sword training that has a breathless feel to it, or exploring for the secrets beneath the Silver Rose late in the book. Adrian keeps the movement flowing and as a reader, I couldn’t help but be swept up in the current, reading late into the night to figure out what happened next. I have one note of caution to potential readers; Shadyia’s journey is dark and twisty. The book is not for the faint of heart. If you prefer your fantasy lighter, seek more whimsical fare. Shadyia’s life, and the lives of those around her, is unpleasant and full of hardships. It’s a tough look at what life is like for a courtesan. Adrian pulls no punches in showing this. However, if books like Game of Thrones are your thing, you shouldn’t find anything objectionable as you follow Shadyia through this book. Highly recommended for fans of dark fantasy with tough female characters and an epic feel. Beneath the Silver Rose is available on Amazon for $0.99! A great price to be introduced to the series. The second book in the series, The Penance of Pride, is also available on Amazon.